Kanawha-Charleston Health Department and Putnam County Health Department gave approximately 9,500 vaccinations during last flu season. 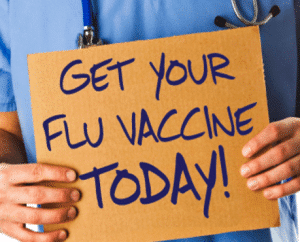 The health departments are again offering flu vaccinations, available Monday–Friday, 8:30 a.m. – 3:30 p.m. According to the Centers for Disease Control and Prevention, everyone six months and older should get a flu vaccination by the end of October, if possible. Getting vaccinated later is still beneficial, even as late as January. “It’s not possible to predict what viruses will be most predominant during any flu season,” according to Dr. Michael Brumage, health officer. “CDC monitors circulating viruses throughout the year and provides new and updated information about the vaccine match as it becomes available.” Brumage said there is always an advantage to getting a flu vaccination because of the protection vaccinations offer. The Kanawha-Charleston Health Department is located at 108 Lee St., in Charleston. The Putnam County Health Department is located at 11878 Winfield Road in Winfield.